I can’t blog about anything interesting (please accept my apology) but I swear I have a worthy reason. You see I am unwell (meaning sick. Really sick) so I’ve been resting for three days now. My throat hurts badly, you know when you feel like there is a prickly, tingly thing in your throat and every time you swallow anything it burns? That type of hurt. My ears can’t hear, my eyes could barely see, my temperature could break a thermometer and my coughing sounds like a 90-year-old man who has been a chronic smoker all his life. So… I have pulled myself into the kitchen couch with layers of clothing, robe, three meter neck scarf, and two (yes TWO) slippers. I only did this because it’s Oprah’s 25th season and missing a single show is a life gone to waste. Dear reader, you see, my recent illness has brought my attention to a HUGE issue in our society. 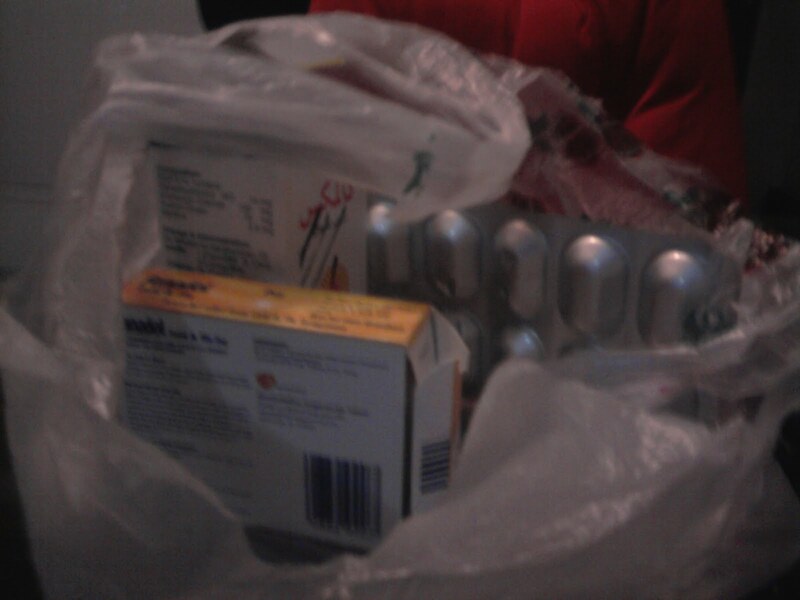 I realized the extent of the issue when a relative came over with an entire bag of medication so that I could recover. There were three different types of tablets that I am supposed to have once every six hours. The size of the tablets are almost as big as the diameter of my esophagus, then there was a bottle of blue-ish, green-ish liquid medication that tasted as disgusting as it looked. The amount of medication brought to me could be suicidal. Above: The bag of medication that I was assigned! There are a few matters of concern here 1) the pharmacy sold the medication without a doctor’s prescription, 2) the amount of medication I don’t believe is necessary 3) No questions were asked about my health conditions (I bring this up because I know for sure certain medications can’t be taken if you suffer from certain health conditions) 4) did I mention that I didn’t even go to the pharmacy myself? I decided to take half a tea-spoon of the repulsive liquid medication and I randomly chose one of the three tablets. The problem is that not every individual in our society has the awareness to make a wise choice not to have all the medication they are prescribed. We’re playing with people’s health here, and it’s important that some sort of action is taken to prevent pharmacies in giving medication to anyone who passes by WITHOUT A PRESCRIPTION. I’m sorry this entry isn’t as bubbly and interesting as it could have been. It’s just a reflection of my mood right now. Meanwhile, I have my idea for my next article, just waiting to feel better so I can do my investigation in Erbil’s medical road!! Be sure I will come back to you with all the details. * Mum – if I feel better it is because of your home-made remedies & the four aunts: Thanks for the recipes, you’re far only in distance but close in my heart! Wish you get better Sazan Xan. My trip plans changed a bit – 18th to 19th at midnight i am landing in Hewler – already have a ticket !!!! i just got the email from great person, who is writting about kurdish problems on Kurdistan Commentary (http://kurdistancommentary.wordpress.com/) – telling me that he read the article about me in Kurdish Globe 🙂 – its a bog honour for me Sazan Xan – that my beloved people in Kurdistan get to know about me, like i know about them. And my request – if possible, can you save a papaer copy of the magazine for me, coz probably in march will be to late to buy it myself, but i wish to have it. One more thing to add, most medication of the local market have no effect and useless. We have to bring them abroad to ensure of its validity. Wondering where is the role of Ministry of Health and Quality Control entities?? My dear brothers and sisters, Kurdistan used to be destroyed by Ba'ath regime for so many years – up to now its so short time the country is buildning up, there are so many things to do and to improve, we have to be patient. I know Kurdistan will slowly achieve the standars of the western world in all branches of life. I hope people will do their best to build up the country. And waht have been done till now its a great achievment, which i wish others can manage to do withing so relativeley short period of time. My relative has a job offer in erbil. and the visa is almost ready. its in a mall called city centre. do u thing its safe to take up the job considering the recent outbursts in the region. how about the cost of living there?